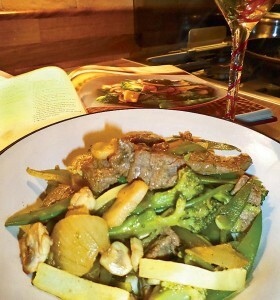 Beef chop suey is packed to the florets with foods to keep you healthy. Instead of the same old vegetables try bamboo shoots. They can improve cholesterol levels, they’re low in calories and their anti-inflammatory properties may reduce the risk of various chronic diseases including heart disease. Fresh mangetout is a good source of vitamin B1 which can quell anxiety, lift depression, ease PMS, and boost your energy. Chestnuts, unlike other nuts and seeds, are rich in minerals and vitamins especially vitamin C. Those who suffer from stress, consume alcohol regularly, smoke or people taking medication may benefit from taking a slightly higher intake of vitamin C. This beef chop suey recipe is fast, easy to cook, tasty and full of nutrients. Don’t order a Chinese, just make it yourself. Combine all the marinade ingredients in a bowl and marinate the beef for at least 20 minutes. Blanch the broccoli in a large pan of boiling water for 30 seconds. Drain and set aside. In a preheated wok or deep pan, heat 1 tablespoon of the oil and stir-fry the beef until the colour has changed. Remove and set aside. Wipe out the wok or pan with kitchen paper. In the clean wok or deep pan, heat the remaining oil and stir fry the onion for one minute. Add the celery and broccoli and cook for two minutes. Add the mangetout, bamboo shoot, water chestnuts and mushrooms and cook for one minute. Add the beef, season with the oyster sauce and salt and serve.